You pick - 43,000 kids in Maine living in poverty or more corporate welfare for a mega-rich General Dynamics - which had $3 billion in profit last year? Who needs help the most? We gathered at Bath Iron Works for the Lenten Vigil today at 11:30 am. They will be held weekly until March 31. 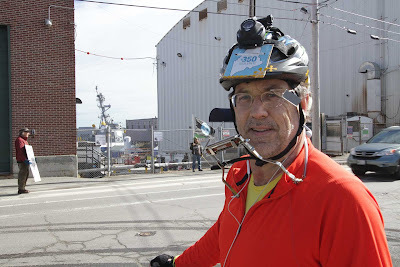 Bob Klotz rode his bike up from South Portland (took almost 4 hours) to join us and link his 350Maine climate change work with our efforts to help Mainers save $60 million. Bob’s been a key force to spread the word about this effort into places where we had few real contacts. 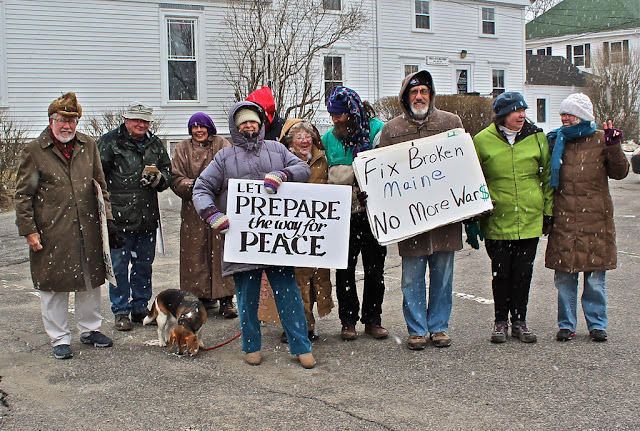 Twenty-eight turned out for the vigil and ‘enjoyed’ the warm spring feeling – but also knew that February in Maine isn't supposed to look like mud season in April. Our signs focused on the moral need for disarmament and the demand for conversion of the military industrial complex if we wish to actually give the future generations a chance for life. 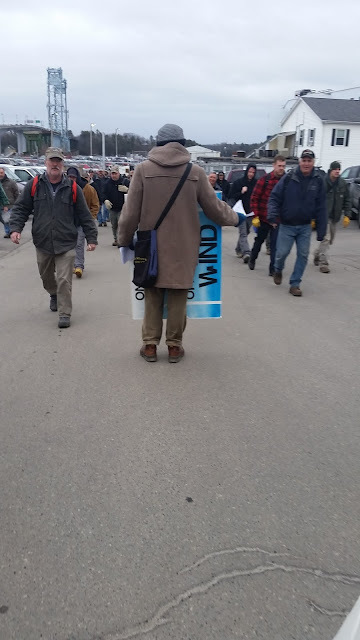 Our signs had images of rapid transit, offshore wind turbines (the Gulf of Maine has the most wind in the US), and appeals to fix broken Maine. People are excited about how things are going and the breadth of the letters to local papers that have been printed. That has been surprising and most helpful. My plan is to go back to BIW on Monday at 3:30 pm to vigil. Then on Tuesday, Feb 27 some of us are going to the House & Senate Chambers (3rd floor) at the capital in Augusta at 9:30 am. The legislature will be in session then and we intend to stand with signs opposing LD 1781. At 1:00 pm on Feb 27 the Taxation Committee again meets to likely finalize the corporate welfare bill and send it off for final vote in the House and Senate. We will also attend this meeting. The legislature will also meet in chambers on March 6 & 8 at 10:00 am and I intend to be at those with my sign. You might have noticed that we’ve had virtually no mainstream media coverage of our campaign – despite all the many letters to the editor. My thinking is that the media feel ‘constrained’ by the power of BIW/GD so they stay in line - after all our state is a corporate colony. But then editors allow the message to get out via our letters. So at least we are getting something out to the public in this era of corporate media clampdown. We’ve been trying to also think a bit more strategically – if you live in a community near one of the legislative leaders in Augusta please get some help and let them know how you all feel about LD 1781. I'd be surprised if this doesn't come to a head by the end of next week. I was back at BIW this afternoon during the 3:30 shift change along with Mary Beth who took this photo of me trying to hand workers a flyer. We learned for certain today that the General Dynamics (GD) welfare bill will come back before the Taxation Committee in Augusta on Tuesday, February 27 at 1:00 pm. I am planning to attend (need to work out a ride) and want to get there at 9:30 am to stand by the House and Senate chambers with my sign as members of the legislature come in for the 10:00 am sessions. I hope to do that several times next week. The Letters to Editor continue in papers across Maine. There were two of them opposing LD 1781 in our local Times Record today and two of them in the Bangor Daily News. It's quite amazing how steady they have been rolling into papers - now more than 70 letters to 20 Maine media outlets since we began this effort. Inside of the packed Taxation Committee hearing room yesterday. I had another one [letter printed] in the Free Press this week. And I had a chance encounter with Sen. John Martin [conservative State Senator] and some lobbyists for BIW. I told them my thoughts about the DESTROYERS and that they kill children and told them I would be arrested at the next "christening". Take care. 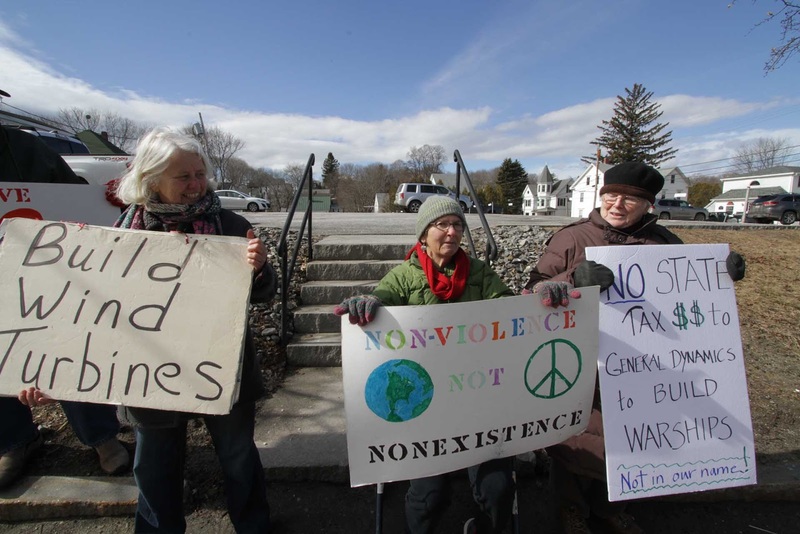 Suzanne is a long-time peace activist in Maine and still drives across the state for protests and various other events. 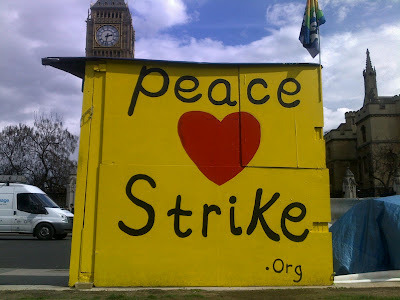 She is an associate member of Veterans For Peace as well. She's one of a kind. We all respect her so much. Finally, as I was typing this blog post I glanced at my Facebook page and there was a lovely message from Jeju Island, South Korea with several photos of folks doing their daily protest at the new Navy base in Gangjeong village. They had one sign offering solidarity with us here in Maine who are campaigning to stop the GD corporate welfare bill. 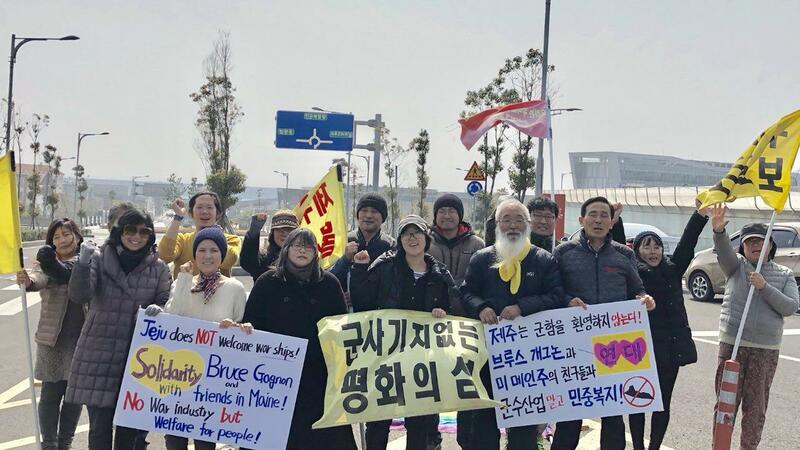 They understand very well what we are doing here as the warships built at BIW are being sent to the Navy base in their community. So we thank them for their solidarity and send our best wishes back to them! Mary Donnelly (on right) and I standing outside the Taxation Committee Work Session room before things began today in Augusta. BIW V-P John Fitzgerald is on the far left leaning up against the wall. The Taxation Committee today voted 8 to 4 to table the $60 million General Dynamics welfare bill again due to outstanding issues not yet clarified after Bath Iron Works V-P John Fitzgerald brought in more amended language to LD 1781. Committee Chairman Dana Dow (R-Waldoboro) though stated that he wanted to reschedule the bill as soon as possible - likely next Tuesday. The sponsor of the bill Rep. Jennifer DeChant (D-Bath) did not even show up for the Taxation Work Session which indicated to me that her role is essentially over. BIW has now taken control of the bill and will be using their economic and political muscle to try to push it through the legislature - sooner rather than later. BIW's Fitzgerald had the job today of explaining the latest changes to the committee (which is largely favorable to the bill) but most of the 12 committee members were visibly confused so they had to table the bill in order to have more time to sort things out. 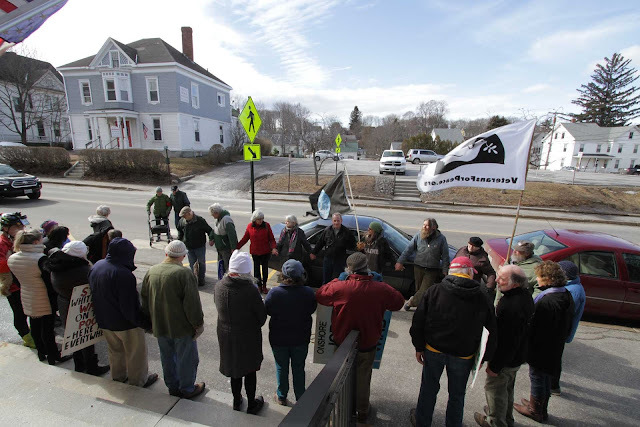 Still several members of the committee raised very serious objections and concerns including those by Sen. Justin Chenette (D-Saco) who said, "We are still not being provided the full financial picture [of GD/BIW].... I'd like to request for the 5th time a clear demonstration of financial need...until that level is met I'm gonna be a no vote." Much of the meeting was spent trying to get a handle on new language that would determine the way the corporate subsidy would be paid, new annual reporting requirements for BIW about how they spent the taxpayer funds, and definitions of things like what is a full-time worker, qualified worker, transferability of the tax subsidy if BIW was sold, and confusing concepts like acceleration and deceleration of the payment formula (depending on the amounts of workers hired at any one time) that virtually no one on the committee understood. Rep. Janice Cooper (D-Yarmouth) made the remark that the confusing acceleration/deceleration clause "could be used to decrease employment due to automation" which BIW has been doing for years by 'mechanizing and modernizing' the operation. In the end this further delay gives us more time to alert the public to this corporate give-a-way bill. We urge everyone to re-contact your state legislative team in Augusta and let them know how you feel about LD 1781. It is very likely that once it does pass the Taxation Committee (all the Republicans and several of the Democrats on the committee support the bill) it will surely be rushed to the floor of the State House and Senate for a vote without much, if any, public notice. 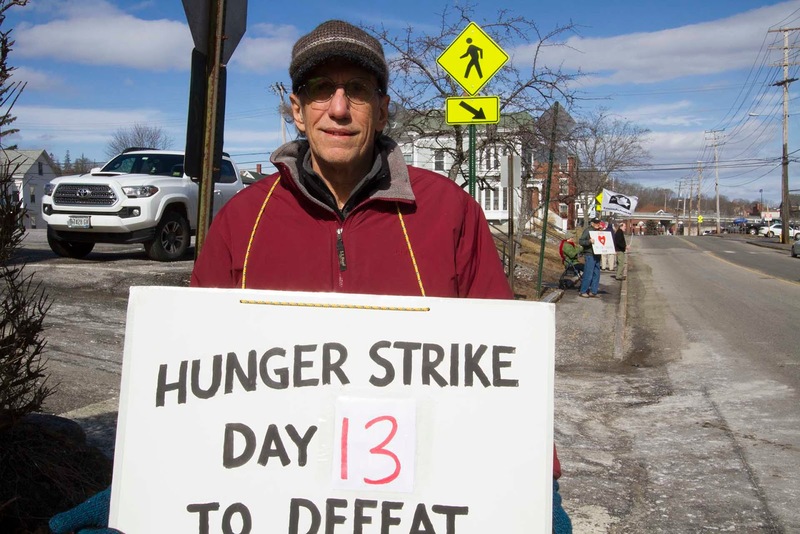 I will continue my hunger strike until the bill is voted up or down in Augusta. Twenty folks from around the state showed up to oppose the bill and we had a chance to talk afterwards. 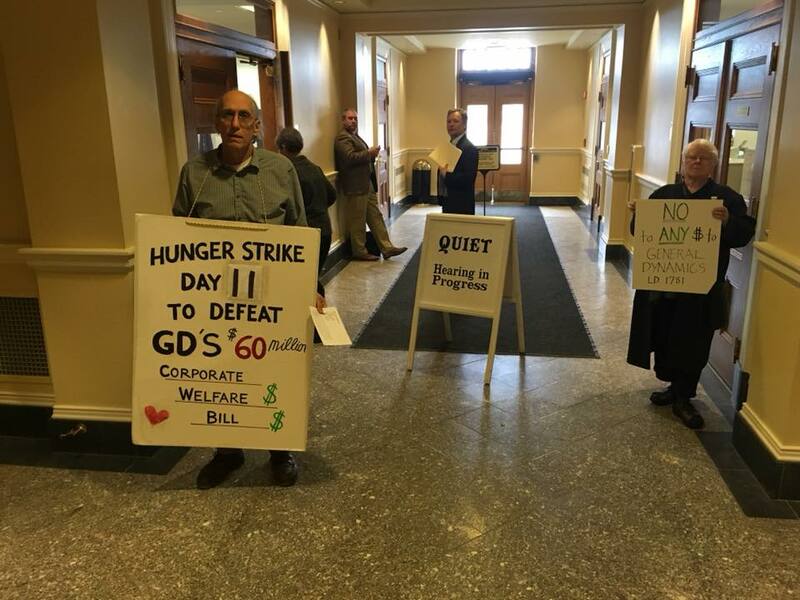 People across Maine and beyond are signing up to join my hunger strike opposing the General Dynamics request for $60 million from the Maine legislature. This corporate shakedown comes from a company that paid their top CEO $21 million last year and made $3 billion in profit. Thanks to everyone for their great support. We are causing a much needed debate about corporate power all over our state which has long been a corporate colony of one form or another. Anti-NATO protest in Sweden where the US and NATO are expanding military operations, including space technology war fighting bases. Sweden and Finland are under heavy pressure by Washington and Brussels to sign on to NATO. If that does not work out because of public opposition as we see in the video, then NATO will attempt to sign them up as 'NATO partners' which still gives the US military control of that country. You've got to fight it the whole way - don't stop when you get half the loaf. There are some good interviews half-way into the video. I handed out seven flyers today at the shipyard. It was a foggy-misty day that happens when the warm air hits the frozen ground. A day of emotion for me. The best moment of my shift change vigil came when a young worker walked up to me and said he wanted to talk. He told me he does not want to build weapon systems for war. We talked about conversion of the shipyard to build things that would help us deal with the coming harsh reality of climate change. He quickly noted the mist because of the warmer temperatures - "It's not supposed to be this warm this time of year," he said. He took my flyer and I asked him where he lives. Bath, he replied. 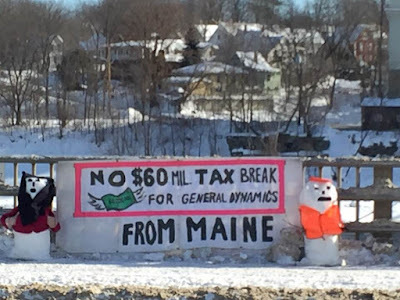 A retired BIW executive had an Op-Ed posted today in a couple of the bigger Maine papers declaring his support for the $60 million gift to General Dynamics from our very poor state. I love the response tweeted by school teacher and activist Lisa Savage (above) to media throughout the state - right on the money as they say on Wall Street. Here’s my story about Bill Haggett: About 40 years ago, [now US Senator] Angus King had a program on TV in which he interviewed people. One night, when I was watching, he interviewed Bill Haggett. Angus asked him to predict the future of BIW. Haggett responded something like this: "In the worst possible scenario, peace.…" I wrote a letter to the editor of the Times Record quoting him. He called me to say, "Mrs. Sternlieb, I am not a warmonger." I’d like to know what else you could call him. So my heart was touched alot today. There is more going on than we realize across Maine. I'm certain that GD did not want to have to engage in debate and a public defense of their corporate welfare bill. They wanted it to slide quietly to passage without anyone knowing about it. But now nearly two months later the bill is in amended form (still no damn good) in committee with another work session on February 22 at the capital in Augusta. There have been more than 65 Op-Eds, letters and radio shows on 20 different Maine media outlets all critical of the bill. As far as I know Mr. Haggett's piece today was the first we've seen speaking in favor of the corporate subsidy bill. Likely BIW/GD determined that they needed to call on one of the old whigs to declare the virtues of the shipyard and up the fear ante about possible closure. He knows the script quite well, they've been recycling it for years. 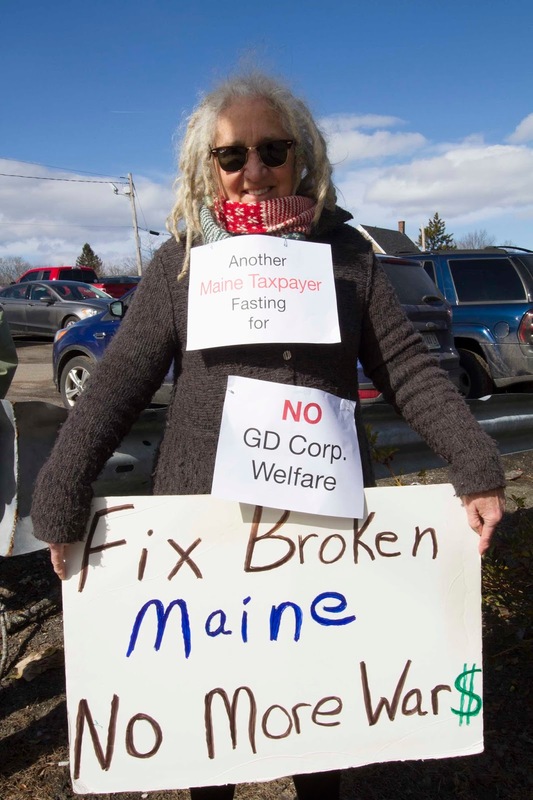 In the end GD is having to work pretty hard for their welfare check from Maine taxpayers. Suzanne Hedrick is the woman in brown coat in the middle of the photo next to man in green coat. She sent this letter today to Rep. Jennifer DeChant (D-Bath) who is the lead sponsor of LD 1781 to give BIW $60 million in corporate welfare. I am 86 years old and have a deep concern for children. I am a retired school teacher and am heartsick over the massacre of children at a high school in Florida. I am also concerned by the massacre of children by US drones, bombs, and other weapons of war. You are a strong supporter of BIW which makes DESTROYERS which, in fact, destroy the lives of children in many parts of the world. 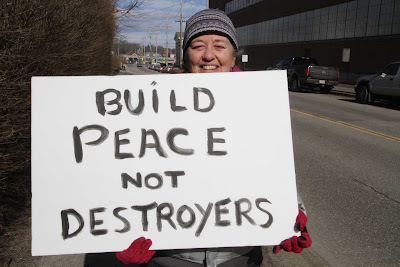 As woman to woman, I must say I find it abhorrent that a woman would give whole hearted support to weapons of mass destruction such as DESTROYERS. The name of these ships alone should convey to you just what their purpose is. We have children in Maine who go hungry every day. Many lack affordable health care and adequate housing. A USS Zumwalt costs at least $4 billion to build. That is taxpayer money going for destruction and not for the desperate needs of people here in Maine. A lead article in today's Bangor Daily News, "Already struggling to pay minimum wage, homes for people with disabilities face cuts July 1." Maine's tax payers should expect our legislators to work for the common good of all its people. Building DESTROYERS and giving billion dollar weapon manufacturers millions of dollars in tax breaks hardly contributes to the common good. Please, for once, think of the children who are targets of Maine's DESTROYERS. 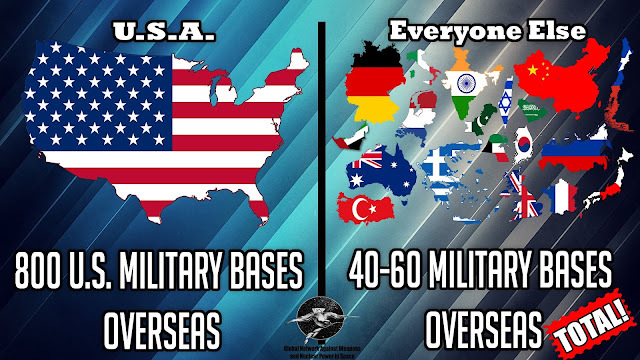 Who has all the military bases? 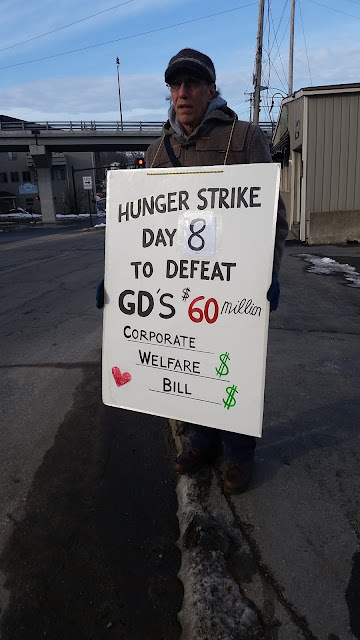 I got a call today from a friend who had spoken to one of LD 1781 sponsors - the Maine bill to give up to $60 million in corporate welfare to General Dynamics (GD). The friend told me the politician, a Democrat, was afraid she would not be reelected if she did not support the bill. This was the same Democrat who had tweeted against Maine Sen. Susan Collins (Republican) when she supported Trump's corporate tax bill that reduced the federal tax rate of GD to 19%. So in this case the Democrat state senator rationalizes her way out of this moral dilemma by considering her reelection the most important issue - greater than the reality of 43,000 kids in Maine living in poverty or roads and bridges falling apart. Why the hell sign up for the job if you are not going to vote for what is right? I went down to the shipyard today at 3:30 pm but the place was mostly shut down due to the Presidents' Day holiday. I'll be back there again tomorrow at 3:30 pm. I am going to skip the noon hour vigiling that I did all last week due to my energy beginning to fade. Today was the hardest day yet for me. I'm not much of a nap taker normally but this afternoon I fell out for 30 minutes. While I was down at the shipyard I did see some people. One guy gave me the middle finger and then made a gun out of his fingers and repeatedly shot me as he drove away. But soon after that another worker walked right up to me and I asked him if he wanted a flyer. He eagerly took it and said he was opposed to the GD welfare bill. He said most workers don't like GD - primarily after how they were treated in their last contract. He said the new contract has a freeze on raises for the next four years, there were cuts in their health care and retirement packages as well as other benefits. So we see GD squeezing the workers while at the same time increasing executive compensation packages and doing major buybacks of their own stocks. Just last week GD spent $6.8 billion in cash to buy an IT company that does military contracting. So GD is partly able to spend like that after they have taken money from the workers and from states like Maine, Rhode Island, Connecticut and Kentucky where the politicians are too 'afraid' to say no. Thanks Regis and all the peeps out there working to save Mainers $60 million. Most Maine people know that GD/BIW does not need another $60 million dollars of taxpayer’s money to keep the doors open. They are scamming the Legislature and the public with veiled threats of closure and job loss if this subsidy is not provided. In fact GD/BIW is one of the wealthiest corporations in America. Here are 10 reasons all of which suggest that this latest round of corporate welfare is unwarranted. 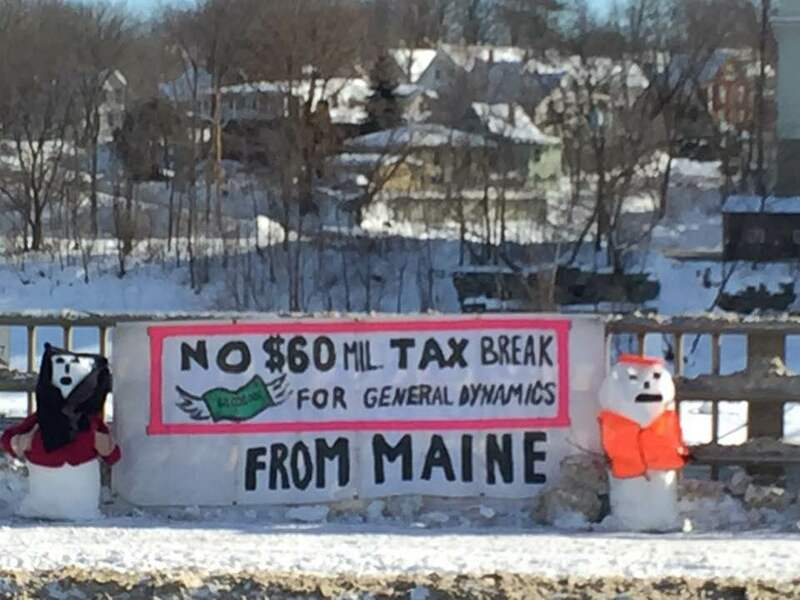 Badgering the state for another $60 million is an abuse of corporate power; giving in to this demand is legislative dereliction of duty—a duty owed to Maine taxpayers. 1. Past and ongoing state tax subsidies to GD/BIW total more than $220 million. Maine taxpayers have already done enough for this corporate entity. 2. GD/BIW (on the Fortune 500 list) is the 90th largest corporation in the nation. In FY 2017 alone GD/BIW generated $31 Billion in revenues (five times Maine’s annual budget) and $3 Billion in profits. This rate of profitability goes back over a decade. Given this level of wealth, squeezing Maine for another $60 million cannot be justified on economic grounds. 3. The CEO of GD/BIW is paid $21 million annually; four other employees in the corporate hierarchy annually earn a combined total of $20 million. At public hearings on LD 1781, BIW’s corporate leadership refused to disclose their levels of annual compensation—but they had no qualms asking Maine for $60 million scarce tax dollars. 4. Beyond enriching management, the extraordinary level of GD/BIW profitability has in recent years allowed $12.9 Billion to be returned to shareholders in the form of stock buybacks. They currently have $2.7 Billion of cash on hand. The assertion that they need another $60 million from Maine taxpayers is ludicrous. 5. The claim that GD/BIW is in competition with the Ingalls yard in Mississippi for navy contracts is also ludicrous. Both yards make this argument in their respective states in order to extort legislative subsidies; these subsidies inflate corporate profits at the expense of taxpayers. The fact is the navy, for strategic purposes, needs/wants both of these yards to succeed. For decades it has almost evenly divided shipbuilding contracts between these two yards and it builds into ship contracts both worker training programs and generous profit margins. 6. The veiled threat that the failure to grant the requested $60 million will cause GD/BIW to rethink its presence in Maine is pure posturing. Recently six vessels were simultaneously under various phases of construction; BIW has a nearly ten-year backlog of work; they have over $500 million dollars invested in the present plant, and a trained workforce in place. No corporate entity in their right mind walks away from a profit-making engine of this size and continuing potential. 7. The recently passed GOP tax bill reducing the corporate tax rate from 35% to 21% pours even more money into GD/BIW’s retained earnings—but they still want $60 million from Maine taxpayers. 8. The recently passed budget bill staving off a government shutdown removed long-standing caps on defense spending. The President/Congress is committed to raising this spending sharply. Given events in Southeast Asia navy procurement of next-generation vessels will certainly increase. BIW will get its share of this spending; it does not need $60 million dollars from Maine taxpayers. 9. To further enhance profit margins, GD/BIW recently acquired CSRA Inc., one of the largest systems research and information technology companies in the nation, for $9.6 Billion. The Departments of Defense and Homeland Security are CSRA’s biggest customers—this completed deal is further evidence that GD/BIW does not need $60 million from Maine taxpayers. 10. Finally, the proposed amendment to LD 1781 breaking it into two $30 million dollar subsidies, each running 10 years, is a total sham. LD 1781’s employment requirements are low and will be readily met. And the $100 million of so-called “new major investment” is defined so broadly that it too will be readily met in the normal course of building the ships already contracted for, or that will be contracted for, as navy defense budgets increase. The present BIW facility will not be altered significantly. In short, Maine people understand most of the above points; so too do most members of the Legislature. We know that $60 million is “chump change” for GD/BIW—but for the people of Maine this is real money needed to address real needs outlined daily in newspapers across the state—the opioid crisis, underfunded schools, dangerous roads, funding health insurance expansion, and more. 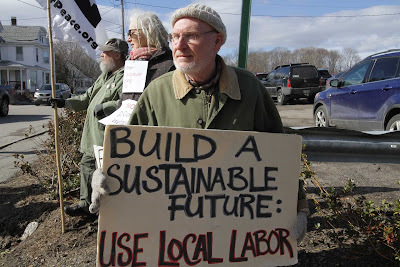 Maine is a poor state; the needs of its people should count for more than marginally increasing profits for one of the wealthiest corporations in America. Shame on GD/BIW for insisting on this $60 million dollar subsidy. If it capitulates to this demand, shame on the Legislature. ~ Orlando Delogu is emeritus professor of law at the University of Southern Maine and specializes in government relations and tax policy. He also writes a regular column for The Forecaster.